BMW R1150GS Windshield Replacement Screen. 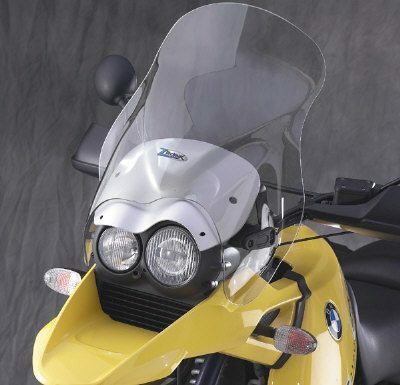 Tint - ztechnik R1150GS windscreen lexan polycarbonate Z2241 BMW R1150GS winshield Takes away irritating wind noise, fatigue, debris, and rain with our generously sized hardcoated FMR Lexan polycarbonate replacement windshields. These R1150GS shields are designed to smooth out wind turbulence, protect you from the elements, and offer you a viewing area with superior optical quality to keep you comfortable during your rides. The ZTechnik Replacement Screens are taller and wider than the stock screen for greater wind protection.Lexan polycarbonate not usual cheap weak perspex/acrylic!! these screens are bulletproof- see our video for proof! Dimensions:H: 18.00 in. (45.7cm) W: 18.00 in. (45.7cm) Material:FMR hardcoat Lexan® polycarbonate , Light Tint. ZTechnik revolutionizes windscreen performance with its new VStream® windshield. While creating a comfortable ride for the BMW sport touring rider, ZTechnik introduces QUIET into the equation. To create COMFORT, other manufacturers will offer taller windshields and spoiler tops to lift the air stream. ZTechnik designed, for the first time ever, a windshield with airflow calculated and adjusted to quiet the rider's environment. In addition, VStream windshields are designed with an unprecedented area of protection and an outstanding level of DURABILITY and OPTICAL CLARITY that is only available through the use of Quantum™ coated Lexan® polycarbonate. The typical airflow pattern of the wake from most windshields is called a van Karman vortex. At speeds of 50-90 mph, the air swirls off the windshield in an approximate 90-degree segment of rotation, i.e. it rolls off the windshield, hits the bottom of the rider's neck on the way up, and curves off the shoulder at approximately 45 degrees. ZTechnik gave the VStream its name for the shape it takes at the upper edge. The "V" shape is so outstandingly quiet because it pushes this vortex out and away more than 4 inches from the side of the rider's head. The rider's helmet then resides in still air, and the passenger's environment is greatly improved as well. The advanced, patent pending "V" profile and three-dimensional contours of all VStream windshields create a calm and quiet air pocket for the rider. This improvement is notable for the passenger as well. Every aspect of finishing a shield will contribute to the comfort level. That's why ZTechnik windshields have smooth radiused edges on 4.5mm-6.0mm thick material. These features and more make VStream the most comfortable windshield you can ride behind on a sport-touring BMW motorcycle. Our exclusive Quantum™ coating for motorcycle windshields.